The issue of lymphedema as a risk resulting from cancer surgery is still not always discussed. Since my cancer diagnosis in 1990, you would think this would have improved. It has to a small degree, but still there is much that is not shared. One of these concerns is the risk of lymphedema due to the pressurization of the plane cabin when flying. Since winter heralds flocks of snowbirds and those of us tired of snow and sleet to warmer climates, I wanted to make sure you were aware and knew what to do. 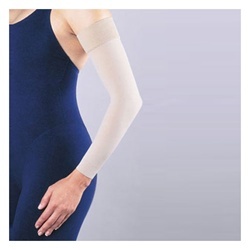 Please invest in a lower compression (preventive) lymphedema sleeve. Wear it on the flight and make sure you also get a gauntlet (glove) with it. Some lymphedema sleeves have the gauntlet as part of the garment. Not only will the sleeve moderate the pressure on your arm, but will also remind you to be mindful when lifting your luggage as heavy lifting is also a risk factor. Prevention is key. Once you are diagnosed with lymphedema, it will be a lifelong commitment of maintenance. Better to prevent if at all possible – at least reduce the risk by being aware.